Chikmagalur, December 3 : Karna Kadur and his co-driver Nikhil Vittal Pai of Arka Motorsports scored their third consecutive Overall win in the Coffee Day India Rally, the fourth round of the MRF FMSCI Indian National Rally Championship, here today, as the duo, in a Volkswagen Polo, nursed their healthy overnight lead with a sensible drive. Behind the trio, hot favorite Gaurav Gill (Musa Sherif), also of Mahindra Adventure, and celebrating his 37th birthday today, set a scorching pace to top the timesheets in all the three Stages today and finished fifth Overall behind private entrants Younus Illyas (Harish KN) and second in the INRC-1 category. More importantly, he earned 10 championship points. 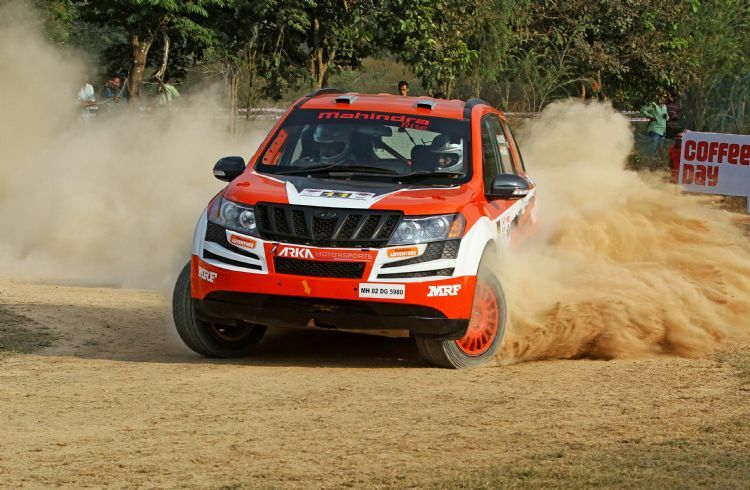 The results meant that Ghosh continues to lead Overall in the Indian National Rally Championship, promoted by the Ramakrishna Race Performance Management, with 79 points as against Kadur's 67 and Gill's 60. Thus, the title will be decided in the fifth and concluding round of the Championship to be held in Kerala next month. Ghosh and Kadur also topped the INRC-1 and INRC-2 categories, respectively, while Delhi's Arjun Bani Rao (Milen George) won in the INRC-3 class as the three-day event, organized by the Motor Sports Club of Chikmagalur, concluded here today. 'The result did not surprise us considering the lead that we had overnight. So, there was no need to push today and I was intent on bringing the car back home safely. We backed off a bit, used the advantage we had and finished the three Stages safely. We are very happy that we won for the third time in a row here in Chikmagalur,' said Kadur. Meanwhile, Ghosh, still to recover fully from an allergy that also hampered his breathing, said he was happy to have finished second which fetched him precious championship points. 'Today, we decided to take it easy in the long stage and push in the two shorter stages. In the context of the championship, it is always good to have points in the bag. So, now, whoever among the three of us (Kadur and Gill being the others) wins in Kerala will emerge champion,' said the London-based Ghosh. For Gill, who was docked six minutes penalty yesterday after failing to complete the last two Stages following a mechanical problem that forced him to pull out, it was a matter of pushing hard and gain positions keeping in mind the championship stakes. A philosophical Gill, winner of the opening two rounds in Chennai and Coimbatore before a retirement in Arunachal Pradesh, said: 'We had a good run the past couple of seasons, but things go up and down. It was not the best of weekends here or in Arunachal. So, now, we will go to Kerala next month and hope to win there. Today, I gave it all I had and drove 110 per cent. It is good that the championship has gone down to the wire. It is good for the sport.